HE WAS imprisoned for months for protesting, as a student, against the dictatorship of Park Chung-hee in the 1970s. 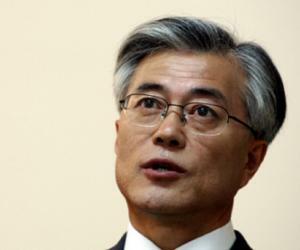 But it was mass demonstrations against the late strongman’s daughter, Park Geun-hye, that brought Moon Jae-in to the presidency. On May 9th South Koreans chose the former dissident as their new president, after the constitutional court prompted a snap election by removing Ms Park from office. Mr Moon, who was sworn in as soon as the votes had been counted, is South Korea’s first left-of-centre president in almost a decade. He won 41% of the vote in a field of 13 candidates. His 17 percentage-point lead over the runner-up, a conservative, is the biggest winning margin ever in a South Korean presidential election. Kim Hyung-jun, a young father who took his toddler to a polling station in central Seoul on May 9th, said that he was voting to create a better society for his daughter: one “where everyone begins at the same line”, not where “the rich and powerful have a head start”. Kim Hyung-jun, a young father who took his toddler to a polling station in central Seoul on May 9th, said that he was voting to create a better society for his daughter: one “where everyone begins at the same line”, not where “the rich and powerful have a head start”. At home, Mr Moon also faces difficult negotiations: Minjoo does not hold a majority in parliament, and the next elections do not take place until 2020. It may rejoin forces with the People’s Party, a centrist group that split from it last year. But the splittists support THAAD and oppose Mr Moon’s plan to reopen the Kaesong industrial complex on the border with North Korea, a sunshine initiative that Ms Park shut. Pervez Musharraf want to return Pakistan, again! Bird Flu is biggest threat to OPEC? Where is Pakistan's Big Data? Why Central African Republic always suffer?